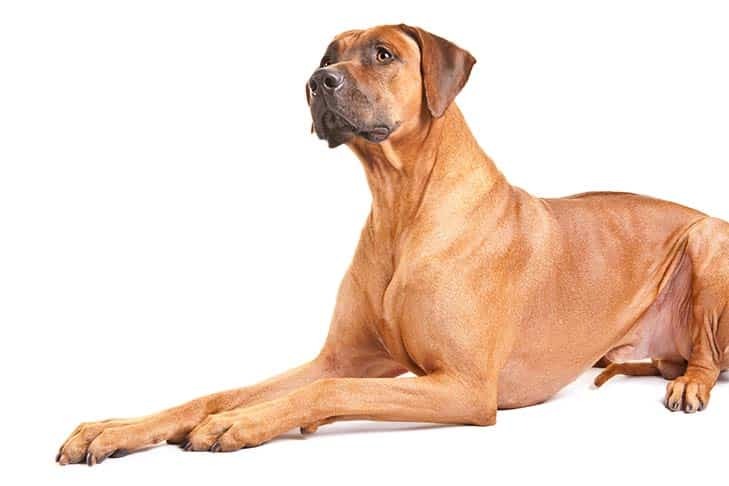 Rhodesian Ridgebacks have large, balanced and muscular frames with short, sleek coats. Bearing the trademark “ridgeback,” they have a line of hair along the spine that grows counter to the other hairs. Their long heads have flat, broad skulls and deep muzzles. Their eyes, somewhat set apart, have a bright and radiant expression, and their noses are black, brown or liver depending on the color of the coat. They have strong, somewhat lean necks, solid backs and strong tails that hang low and curl up slightly. Their glossy coats come in wheat or red. 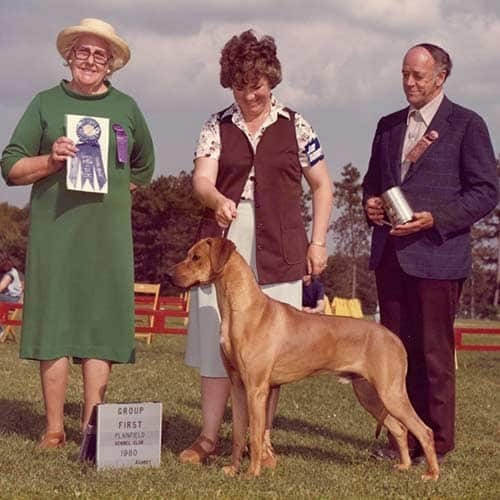 Overall, Rhodesian Ridgebacks carry themselves with equal amounts of dignity and athleticism. Beneath the Ridgeback’s trademark ridge is a whole lot of hound. Ridgebacks are fast and powerful athletes who can weigh between 70 and 85 pounds. They come in only one color – wheaten – which spans every shade in that spectrum. Ridgebacks also have two nose colors: black and the less commonly seen brown. 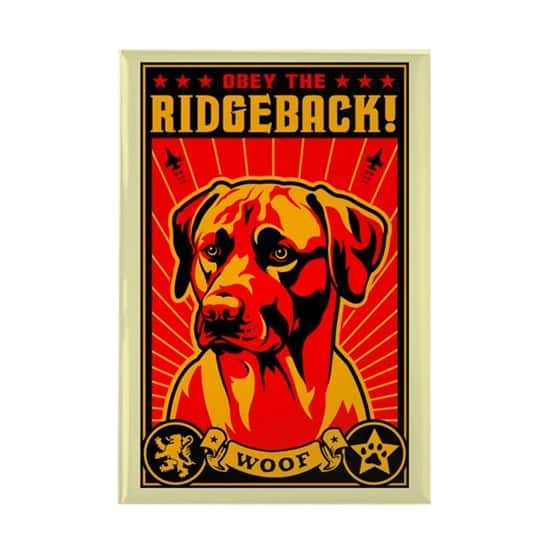 The formidable Ridgeback can be strong-willed, independent, and sometimes domineering. Ridgebacks must be guided with a firm but a fair hand from puppyhood. They are faithful friends, protective of their loved ones and meltingly affectionate with those whom they trust. Still, a Ridgeback can be too much hound for the novice dog owner. Rhodesian Ridgebacks can be a little stubborn. They need consistent and patient training from someone willing to dedicate the necessary time and attention. 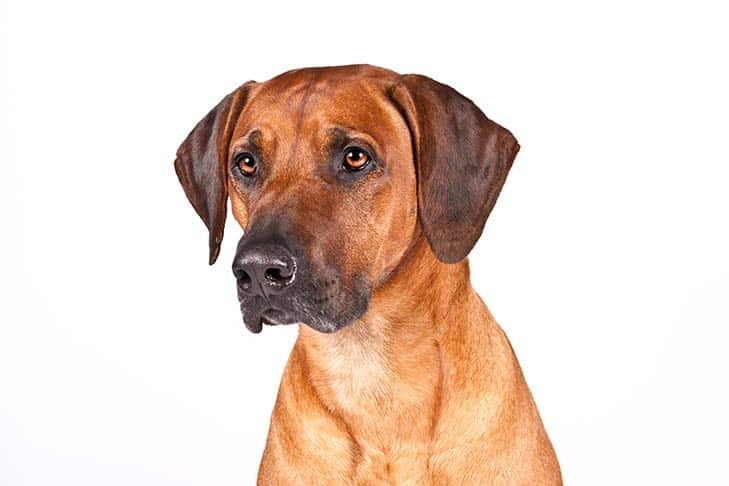 Alert and intelligent, Rhodesian Ridgebacks learn quickly. Because they have very active minds, they need plenty of tasks and games to prevent boredom. Ridgebacks have powerful hunting instincts. Unless you’re in a controlled area or out in the countryside, always keep them on a leash. Also, remember that these dogs were bred to hunt lions: They are fearless in almost any situation, especially around other dogs. A healthy Rhodesian Ridgeback can live as long as 12 years. Common health issues include hip dysplasia and heart problems. Overall, they are healthy and hardy. Their glossy coat is easy to groom, but they do shed quite a bit. Ridgeback hair can be tough to remove from carpets and furniture, so regular brushing outdoors is a good idea. The Rhodesian Ridgeback is an all-purpose “Renaissance hound” whose hallmark is the ridge, or stripe of backward-growing hair, on his back. Though the breed was made famous in its native Africa for its skill at tracking and baying – but never, ever killing – lions, today Ridgebacks are cherished family dogs whose owners must be prepared to deal with their independence and strong prey drive. 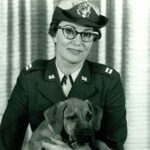 The Rhodesian Ridgeback should do well on high-quality dog food, whether commercially manufactured or home-prepared with your veterinarian’s supervision and approval. Any diet should be appropriate to the dog’s age (puppy, adult, or senior). Ridgebacks are notorious “counter surfers,” so be sure not to leave human food unattended. Some dogs are prone to getting overweight, so watch your dog’s calorie consumption and weight level. Treats can be an important aid in training, but giving too many can cause obesity. Learn about which human foods are safe for dogs, and which are not. Check with your vet if you have any concerns about your dog’s weight or diet. Clean, fresh water should be available at all times. The Rhodesian Ridgeback does shed somewhat, but overall his grooming needs are minimal. 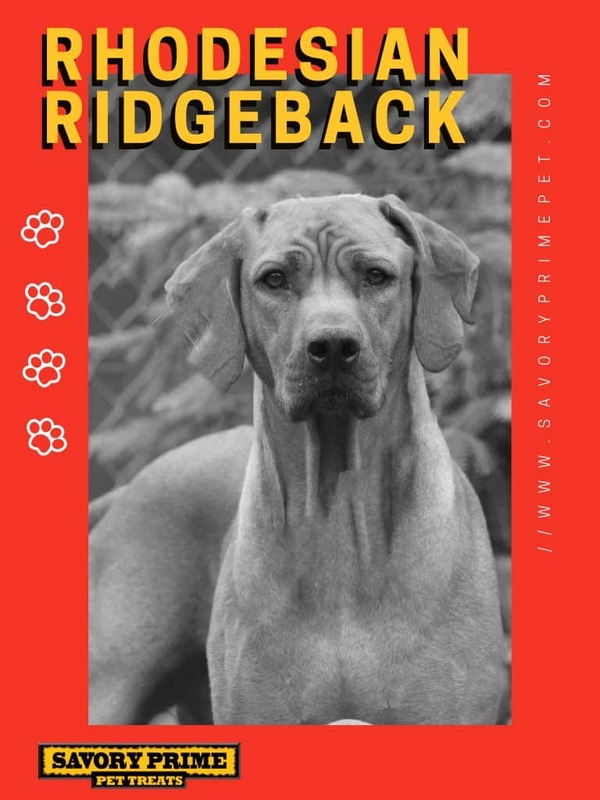 Regular weekly brushing will help to remove loose hair and keep the coat glossy, and an occasional bath will help to keep the Ridgeback clean and looking his best. The nails should be trimmed often if not worn down naturally. 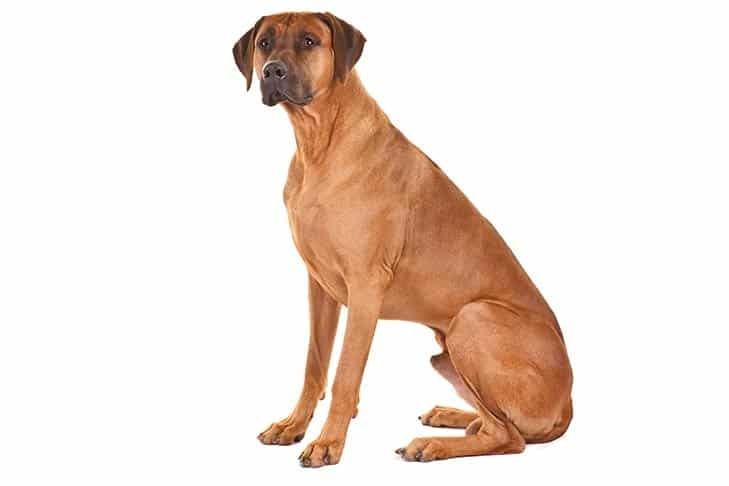 Rhodesian Ridgebacks are strong, athletic dogs who require a moderate amount of exercise, and they can adapt well to various living situations when provided with daily outings such as long walks and play sessions with their owner. They love to run, and they need physical activity to help keep them healthy and happy. 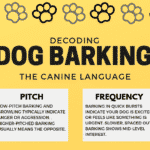 The breed can also exercise mind and body by participating in canine sports like tracking, agility, and other activities that the dog and the owner can enjoy together. Because of their very strong prey drive, Rhodesian Ridgebacks should always be in a safely enclosed area when off leash. The Ridgeback is a devoted companion and needs to live indoors with his human family. They can be strong-willed, independent, and sometimes domineering, and must be guided with a firm but a patient hand from early puppyhood. 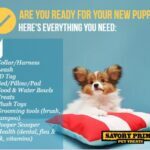 Early socialization and puppy training classes using positive reinforcement are recommended and help to ensure that the dog grows into a well-adjusted, well-mannered companion. 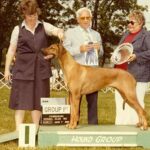 Rhodesian Ridgebacks are generally healthy dogs, and responsible breeders screen their dogs for hip and elbow dysplasia, thyroid function and eye anomalies. Dermoid sinus is a tube-like opening in the skin that is occasionally present at birth; an experienced breeder can palpate, or feel, for this defect. 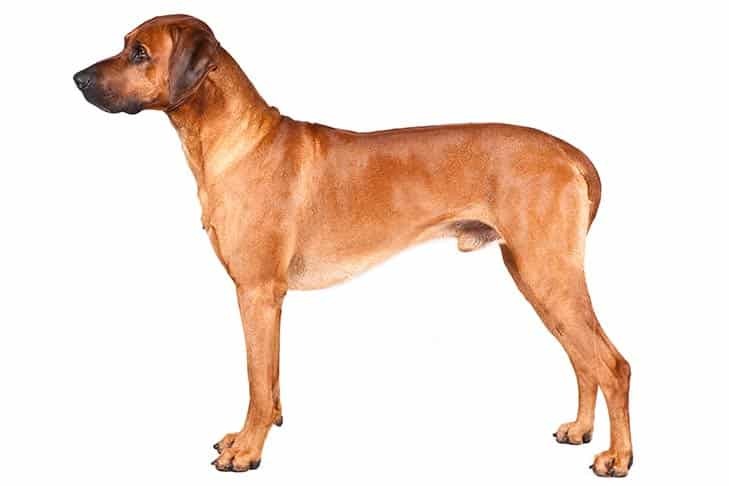 The Rhodesian Ridgeback is a unique creation of southern Africa, resulting from crosses between the native Khoikhoi dog and European breeds brought by Dutch colonists. Infusion of native Khoi blood gave resulting generations a resiliency against local pests such as the tsetse fly, as well as an inborn knowledge of how to navigate their new African environs – and outwit its deadly predators. In the late 19th Century, Rhodesian big-game hunter Cornelius van Rooyen incorporated two ridged Greyhound-like females into his pack of lion dogs. He found that their ridged offspring excelled at confronting and confounding the king of beasts, giving the hunter time to sight in his rifle and dispatch his prey. These ridged dogs were also successful at fending off other dangerous animals such as leopards and baboons, trotting effortlessly alongside horse-mounted riders all day, breaking off to course quick-footed game such as antelope to provide meat for the pot, and protecting the homestead from all intruders. They were known then, as they are today, for their devotion to family, and tolerance and affection for its children. 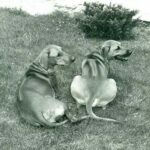 In 1922, the writing about the Rhodesian Ridgeback was conducted. By then, big-game hunting had already begun to fade in South Africa, and the breed itself was on the brink of extinction. 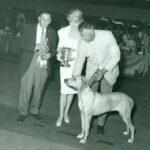 The dogs convened at this meeting ranged in size and appearance from Bull Terriers to Great Dane, and the Dalmatian standard was used as a template to arrive at the standardized vision of the breed that we know today. 1. Many breeds are believed to have been involved in the creation of the Rhodesian Ridgeback, including the native Khoikhoi dog, Greyhounds, long-legged Bulldogs, Terriers and, later, Great Danes to add size. 2. The Rhodesian Ridgeback is a medium-large dog originally bred in southern Africa to hunt large game, including lions. It was previously known as the African Lion Hound. 3. The first breeder of Rhodesian Ridgebacks in the United States was movie star Errol Flynn, who reared them on his Hollywood ranch in the 1930s. Sadly, that bloodline is now extinct. 4. Dutch settlers in South Africa, called the Boers, crossed their European dogs to the native Khoi dog, which passed on its signature ridge. Hundreds of years later, the breed was formally developed by big-game hunter Cornelius van Rooyen in Rhodesia to the north. 5. The hallmark and namesake of the breed is the ridge of forward-growing hair on its back. 6. The Rhodesian Ridgeback was recognized by the AKC in 1955.